I don’t want to be a genius. I have enough problems just trying to be human. Wet Crow’s Island (鴉の濡れ羽島). In Russian, the name means where the reaches of despair lie (絶望の果て). It is an island that evokes the paradoxical double image of a paradise: both heaven and hell. There, a mansion where only geniuses all over Japan could visit towers over the seas. You can converse with people who have revolutionized the world during dinner, but you can’t leave this island situated somewhere in the Tokyo prefecture without a boat. It is the perfect setting for a mystery. A mystery that will shake the foundations of the world. A mystery that will attract detective wannabes and mystery fans all over the world. But Ii-chan is not a genius nor is he that interested in mysteries. He likes to read mystery books, but that doesn’t mean he is going all out looking for a real one. Kunagisa Tomo, his childhood friend, dragged him here — to the end of the world. He was supposed to be adapting to his new life in Kyoto. Houston, Texas and Kyoto, Japan are 6,856 miles apart and both embrace different cultures. Quite the difference. He may be returning to his hometown, but he probably should get ready for university too. Classes are starting about now. It would be pretty embarrassing if he skipped the introductory sessions. But well, that’s what he is doing now because he’s on an island with the most talented people in the country and can’t just leave Tomo behind. At least, there are maids. Cute triplet maids. He doesn’t belong here anyway. Not many people remember who he is (though he is reluctant to tell people what his name is) and he is by no means a genius. No special attribute defines him. He does have a very bad memory, but that’s about it. So he is possibly the least exciting figure on the island. And when there’s people like Ibuki Kanami (伊吹かなみ), it’s easy to come to that conclusion. Just look at Kanami’s paintings. Her artworks are well-known and probably one genius brushstroke of hers would cost millions to own. Sashirono Yayoi (佐代野弥生), on the other hand, is a master of the culinary arts. She may be tonedeaf, but she is extremely sensitive to taste and can even taste someone’s feelings by licking them. Sonoyama Akane (園山赤音) is one of the seven people who topped the ER3 System, a mysterious educational program taught in the United States; to put it lightly, she is damn intelligent. And finally, there’s Himena Maki (姫菜真姫) who is no ordinary fortune teller. She seems to possess extrasensory perception and can see into the past and the future. Maki might as well be as omniscient as the gods because she can transcend time and space. These very interesting and intellectually stimulating people now roam the mansion because Akagami Iria (赤神イリア), the ex-heiress to one of the biggest zaibatsu in Japan, had invited them. Due to some circumstances, she has cut her ties to the Akagami family and now lives alone on Wet Crow’s Island. Her biggest joy in life is being around geniuses. Smart people are amusing. Handa Rei (班田玲), her confidante and the chief maid of the house, is responsible for her well-being. The triplet maids Ii-chan is enamored with — Chiga Akari (千賀 あかり), Chiga Hikari (千賀ひかり), and Chiga Teruko (千賀 てる子) — serve as the backbone of the estate and keep things in working order. So there aren’t that many people who Ii-chan can talk to. Not on an equal level, that is. At least there is Sakaki Shinya (逆木深夜) who is in the same boat as he is. Just a cool ordinary dude and thus a perfect chatting partner for the estranged Ii-chan. Shinya only came because Kanami came; her paintings saved his life from depression. He is willing to be a knight for her cause. Ii-chan can also talk to Tomo as well, but their relationship is kinda weird. He has to bathe Tomo every time (she hates bathing) and remind her to eat some food. Tomo clearly likes him. Maybe she loves him too. She enjoys confessing to him about how much she likes him, but Ii-chan just waves it away. He doesn’t see it as serious and that’s why he doesn’t care. She’s just the blue savant (青色サヴァント) in his eyes. A genius inventor who could be placed alongside Nikola Tesla and Alan Turing. She could make a computer operating system from scratch and it wouldn’t be funny because she just did that. She really can make the impossible possible. Ii-chan doesn’t deserve such a person in his life. All he has is a bad memory. He just jokes and makes irresponsible statements about his surroundings. No hope for the future, no energy for the present. Only jokes, tricks, nonsense. He now remembers what his talent is: yes, he is a nonsense bearer of sorts, a 戯言遣い — a really good bullshitter. Ahh, wouldn’t death be good? He wonders about disappearing away and the past he once had before meeting Tomo. Death would be the most irresponsible thing he could do in his position. That’s why it’s perfect. Perfect for a 戯言遣い like him. Perfect for a failure of a human being like him. Perfect for someone who shouldn’t be in this world anymore like him. Ii-chan is the perfect narrator for a long stream of murder mysteries to come. 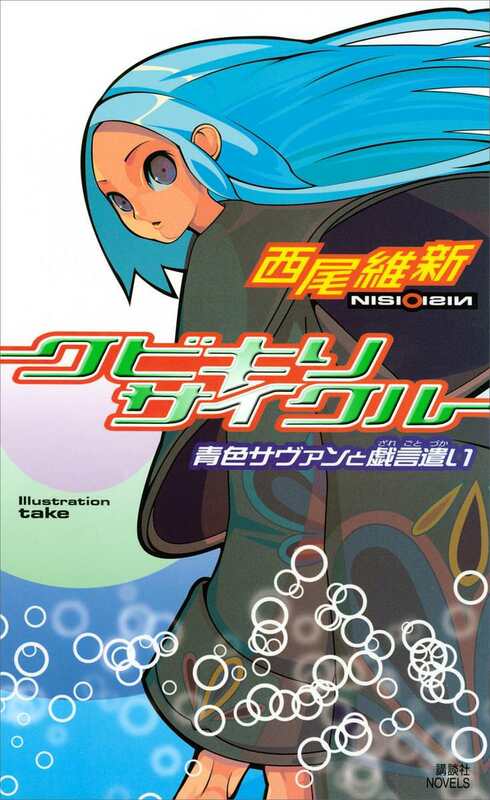 Kubikiri Cycle: The Blue Savant and the Nonsense Bearer (クビキリサイクル 青色サヴァンと戯言遣い) is the first book of the Zaregoto series (戯言シリーズ) and of the long catalog of books by the prolific writer Nisioisin (西尾維新). Published when he was only twenty years old, it won the Mephisto Prize and recognition from various acclaimed mystery writers and critics. Its high attention to detail and prose caused him to be recognized by peers as a genius in his own right. It is however somewhat difficult to describe in English what makes him a genius when it comes to the book. While it is notable he wrote the book before he was legally allowed to drink alcohol in the States, his genius appears less in the words, actions, and plots of the work and more in the crevices of the text and the incomplete fragments that do not see the light of day. His writing is actually easy to read contrary to Western perceptions of Japanese writing. He may love puns, but he also puts weight in simple sentences. The only parts that feel dense are the long philosophical dialogs on what it means to be a genius and that’s only because of the content. Otherwise, he makes you want to read the next page and see what happens. The experience of reading a Nisio book in Japanese is so smooth you can forget you’re reading a book. Ii-chan’s narration drills into your head as streams of consciousness. The world is as nonsensical and weird as he makes it out to be. His observations never gets old and he is a curious case when it comes to his role as a protagonist. Never too passive or too proactive, he likes to fool around and brood over his meaningless life. There isn’t a case where his inappropriate thoughts did not match up with the tone of the book. That could only happen because Nisio is very sensitive to how the Japanese language reads. It reminds me of Yayoi’s sensitivity to taste as well; both can find balance in the ingredients they use to create something more than perfect. Nisio’s writing in Zaregoto is not perfect, but it reaches for something more. An accomplished thirty-five year old mystery writer who is willing to let loose their imagination could write like this, but Nisio cut fifteen years off that age requirement and added moe elements to the genre. More of his prose will be described in future posts, but suffice to say, it is something special. Of course, we should also not forget that Kubikiri Cycle is a classic traditional mystery with a twist. A shinhonkaku one, that is. According to Zaregoto Dictional — a book on his writing process — Nisioisin was cycling to somewhere in Kyoto when he thought up the trick for the book. He thought it was too simple because it was just one plot twist. What if there was another? Still too simple. What if those two twists were based on one huge misdirection though? Mystery plot twists happen because the narration misleads us to expect one thing and not the other; however, this plot twist Nisio thought up — and what gave him this huge positive reception — was not just a plot twist. It threatened the sanctity of fair play in mysteries without obliterating it completely. The concept of fair play is simple: they are the underlying assumptions that make the puzzle game of mysteries work. Suppose you read a mystery book and get involved into the exciting adventure of it all — and then, it is revealed someone with magical powers perpetuated the crime: wouldn’t you feel duped? The whole reading experience would feel like a waste of time. Fair play makes mysteries fair and solvable. They make it fun. The puzzle is challenging but not ridiculous. It’s fun to take mental notes of any clue you find interesting, funner to get it right, and funnest when you realize you are fairly misled by the simple and clever trick. It’s what draws people to mysteries and why everyone calls these writers geniuses. Shinhonkaku mysteries make a big deal of fair play. Some try to show the limits of fair play and others call it a sham. The Zaregoto series does both. In the case of Kubikiri Cycle, it is in the former but as we will see shortly the book is an outlier in this regard. Nevertheless, Kubikiri Cycle has a very solvable mystery. It does involve huge leaps of the imagination to solve the mystery — like a good Japanese mystery book. You wouldn’t think of this, but that’s the genius of it. It’s a diabolically simple twist that will make you mad and laugh. Rereading this book in Japanese/in 2018 (I read the Del Rey translation in 2012, though I haven’t had the chance to read the Vertical retranslation yet) reveals more of the genius inside the text. I recommend rereading the prologue before you reach the epilogue because that introduction takes on a whole new context. That said, the mystery won’t work without this eccentric cast whose quirks would be very familiar to fans of the Monogatari series. You know who they are from the first page they appear in. Characters make a strong first impression with the way they speak (in Japanese, it is even clearer with pronouns: characters like Tomo, for example, describes herself as 僕様ちゃん/boku-sama-chan) and could engage in long and dense conversations with the narrator. Maki, the fortune teller, is quite notorious for this as she confronts Ii-chan on the meaning of a genius. Her conversations bear the thematic weight of Kubikiri Cycle and ask an implicit but meaningful question: Is there value in a worthless and average human being like Ii-chan in a world of geniuses, savants, and influencers? There is. Not just in the way you would expect. In the context of a mystery, Ii-chan is a Watson figure. Tomo, who actually came to the island to investigate a past case, is more of the Holmes type. She likes to chide him for his memory and prides herself in remembering everything. Yet, she is a hikikomori, a shut-in who can’t go downstairs without help. She may be a savant and can solve the mystery without anybody’s help, but she can’t be the one to close the case. That responsibility goes to Ii-chan. He is after all the protagonist of the book (and the series). In the beginning, Nisioisin wanted to write the books with the strongest private contractor in the world, Aikawa Jun (哀川潤). She appears at the end of Kubikiri Cycle to supplement Ii-chan’s logic, but she is willing to contradict the clues Ii-chan has picked up. Her presence is meant to overwhelm Ii-chan and the readers, but incidentally she affected Nisio too. It was just too much to have her as the central protagonist of the book. So instead, he tried to focus on Tomo with Ii-chan as a typical Watsonian storyteller. The editors and Nisioisin found Ii-chan however too charismatic in a weird way. He just has to be the protagonist of the work. Ii-chan is the only one who can tell this story in his unique disaffected way. This narration, for better or worse, will become the distinctive trait of the Zaregoto series and why people including myself are in love with it. Ii-chan is only a kid who feels alienated in a big world of chaos. He has a severe case of desensitization and thus considers himself to be another flotsam in the ocean of society. But that’s why his voice matters. Even if Jun, Tomo, and whoever else are more important, he is the character you root for. His role can be somewhat nonsensical and small at first glance, but he is still important in his own way. Ii-chan deserves a happy ending like everybody else. Mysteries may be one huge joke and the world is cruel, but he should be able to live life in peace like the rest of them. Nobody needs to grow up to be a genius to have a happy life. They can be flawed human beings who want to escape the past and still get the ending they deserve. Seen this way, the Zaregoto series becomes less of a mystery work and more of a coming of age story. It follows the ebb and flow of a teenager who is trying to find a place in the world and understand what his relationship with people is supposed to be. Growth is painful, but it is not a mystery. It is something we all face everyday: we learn to drop what is perceived as mystical and make peace with our genius-less lives. This is only the beginning of Ii-chan’s journey to adulthood. Kubikiri Cycle may be the first book of the Zaregoto series, but it is also the beginning of the end. It is the beginning of mysteries being left behind in the dust. Let’s move toward a high school crush which can only be crushed.